Experiments were conducted for the flow in a straight-walled 3D diffuser fed by a fully developed turbulent duct flow. Previous work found that this diffuser has a stable 3D separation bubble whose configuration is affected by the secondary flows in the upstream duct. 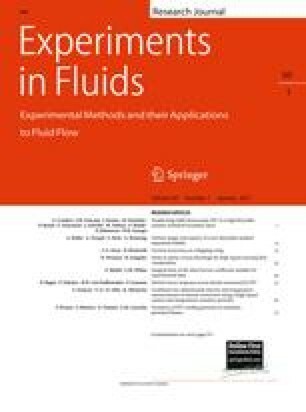 Dielectric barrier discharge plasma actuators were used to produce low-momentum wall jets to determine if the separation behavior could be modified by weak forcing. Actuators producing a streamwise force along the wall where separation occurred in the baseline flow had a relatively small effect. However, spanwise acting plasma actuators that produced a pair of streamwise vortices in the inlet section of the diffuser had a strong effect on the diffuser pressure recovery. The diffuser performance could be either improved or degraded depending on the actuation parameters, including the actuator modulation frequency, duty cycle, and drive voltage. Velocity profile measurements in the diffuser inlet showed that the streamwise vortices affect the uniformity of the streamwise mean velocity accounting for some of the performance changes. However, phase-locked hotwire measurements at the diffuser exit indicate that the periodic nature of the forcing also plays an important role for cases with enhanced pressure recovery. We gratefully acknowledge the financial support of several organizations. Sven Grundmann was supported by a fellowship from the DAAD (German Academic Exchange Service) and Emily Sayles was supported by a National Defense Science and Engineering Graduate Fellowship and a Stanford Graduate Fellowship. Research expenses were supported by Siemens Power Generation.